The True Story of Pilot Howard Snyder and the Crew of the B-17 Susan Ruth; By Steve Snyder; Sea Breeze Publishing; 362 pages; illustrated. While Snyder thoroughly mined his father’s wartime journal, he also undertook extensive research in historical records and declassified files. He also conducted a great deal of modern-day detective work to track down the relatives of the crewmembers who flew aboard the Susan Ruth, and to connect with everyone from former Luftwaffe fighter pilots to the families of Belgian and French resistance fighters. 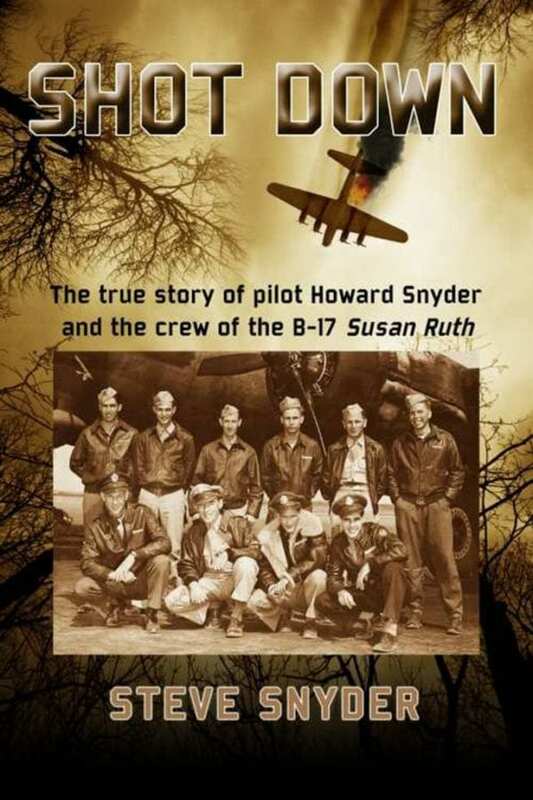 Shot Down: The True Story of Pilot Howard Snyder and the Crew of the B-17 Susan Ruth; By Steve Snyder; Sea Breeze Publishing; 362 pages; illustrated. The result is a book that takes the reader through training and into combat side by side with the crew of the Susan Ruth, and into the households of the French and Belgian members of the resistance who sheltered the shot down Americans and worked to get them safely back to their own side. The vivid and evocative writing and copious illustrations personalize aspects of World War II often overlooked by historians while it also explains the tactics and equipment of the air war and examines the broader war through the lens of those who were trying to survive it. Along the way, it recognizes the individuals who flew and fought against the Germans, both those in uniform and the “conquered” civilians in the occupied territories, and describes their individual and common fates. Shot Down is a book where the author’s care and respect for his subjects as well as his talent, integrity, and hard work come through on every page. An engaging page-turner of a military history and winner, so far, of 15 national book awards, Shot Down is highly recommended.